What could be more “spring” than the tulip? Sprouting up through the snows of March and April, the leaves give promise to the arrival of the beautiful flowers later in the spring. Heralding the end of spring and the beginning of summer, tulips might have been made for Mother’s Day. No place is more associated with tulips than the Netherlands. Iconic pictures of tulip fields with windmills in the background evoke the low countries as much as do wooden shoes and massive sea-dikes. For historians and economists, those pictures of tulip fields also remind them of the Tulip Mania period of Dutch history. During the mid-1630s, prices of individual tulip bulbs soared precipitously. Fortunes were made and lost. Bulbs were sold for the price equivalent of several acres of land, or for several months’ or even years’ wages of an average citizen. Tulip bulbs first made their way into western Europe from Turkey, particularly from the courts and royal gardens of the Ottoman Empire. Easy to move, easy to grow, and (from bulbs) quick to flower, they became very popular everywhere they were introduced. Their vivid colors, their hardiness in cooler European climates, and their shapely form (often poetically compared to female anatomy) made them a favorite among horticulturalists and gardeners alike. For both novice and experienced gardeners they are a rewarding feature in almost any landscape. Although it’s uncertain where they first became subject to the Mosaic virus, tulips in Western Europe would randomly become “broken” because of illness. The virus affected the longevity and the overall health of the plant, but it also created uniquely colored and patterned flowers. Thus, gardeners would sometimes plant a tulip of one color and realize a flower that was very different. These flowers would often, but not always, replicate the same features in their offsets. Although the science had not yet discovered genetics nor viruses, growers tried to propagate these happy accidents. Since tulip bulbs will create offsets, they were often successful since the offsets are essentially clones of the original bulb and if the original bulb is infected, they usually were as well. Despite being sick with a virus, the color variations and uniqueness of these ill flowers increased the demand for them, and since the illness shortened the life expectancy and the productivity (in creation of offsets) of the infected plants, it also reduced the supply. Early in the 1630s, demand for these unique tulips infected with the Mosaic virus began to increase. This coincided with the introduction of a “futures” market. Tulips could be purchased on speculation and then sold again on speculation without either the buyer or the seller actually physically owning a bulb. Most of these transactions occurred in the backroom of taverns in Amsterdam, Haarlem, and other towns in what is now the Netherlands. These tavern transactions kept them out of the mainstream economy. No doubt they were of great importance, economically and otherwise, to the participants. But they occurred within a sort of shadow economy beyond legal recognition or regulation and without the participation of the real movers and shakers among Dutch. This no doubt allowed the mania to flower (pun intended), but it also protected the country as a whole when it eventually withered (yes, I did it again). And wither it did. The height of the speculative pricing for the tulips was reached in January, 1637. In February, it suddenly stopped. Tulips that a month before could not be purchased for almost any price now could not be sold for any price. Buyers that in January were willing to mortgage their houses to pay for a few bulbs were unwilling to pay pocket change for those same bulbs in February. The result: people were left owing a fortune to growers with no way to pay them back. Growers were left with paper IOUs equivalent to millions of today’s dollars, and with fields of tulips that no one wanted to buy any more. It’s easy to look back and laugh at the folly, but this was the first “bubble” and crash seen in the modern economic system. In many ways it was a harbinger for future stock and dot.com and housing bubbles that were to come. Buy low and sell high is great advice, and is usually only obvious in hindsight. If the lessons taught by these backroom deals in Dutch taverns were easily learned, we likely would have mastered them by now. Any economist or even casual investor can tell you, we have not. Perhaps the best lesson to be learned is that tulips are an investment in beauty. A garden may be enhanced by them, A mother or sweetheart may appreciate a bouquet of them. The Golden Age of the Netherlands hardly noticed this blip in their economy, and because of some (late) regulatory intervention, most investors and growers did not lose everything despite the paper losses they may have incurred. If you want to make a fortune, tulips are not the commodity to buy. But if you want to make a splash around Mother’s Day, it may be the perfect investment. 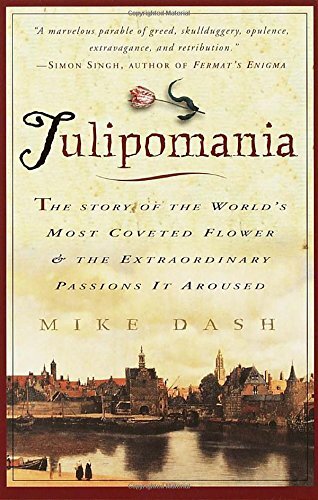 Mike Dash’s book Tulipomania covers the history of the flower, from its emergence in Ottoman gardens to its spread into western Europe to its central place in the craze of 1630s Dutch speculation. Although the book is sometimes a bit dry and academic, it does a good job of emphasizing both how intense the mania was and yet how peripheral it was to the overall economic health of the affected areas. If you are looking for an accessible introduction to the subject, I recommend Tulipomania as a good starting point.